Every good meal needs an excellent side dish! Our new Bio Cheese Feta had us dreaming of something heart-warming yet light and flavourful. This particular dish has always been a favourite of ours and our guests, needless to say it lacked that extra hit of both creaminess and saltiness. Thus, with the arrival of our Bio Cheese Feta, it was time to get experimenting… and boy, oh boy did this dish become a WHOLE lot better! With it’s perfect, crumbly consistency, our Bio Cheese Feta is the perfect addition to this side dish - or any other you might be preparing this weekend! Place your cut and cleaned beetroots hearts on a paper-lined tray. Drizzle with olive oil and add a sprinkle of salt and pepper before tossing. Place in oven to roast until inside is soft. Test this by piercing with a fork. To prepare the bean puree, place butter beans, garlic, 2 tbsp olive oil, salt, pepper and lemon juice into a food processor. Continue to combine until smooth. Taste to ensure it has a slightly “tangy”taste. Heat a small saucepan. Evenly coat with a small amount of olive oil. Toast your pistachios until lightly golden. Remove from heat and drain on paper towel. Set aside. To serve, apply your butter bean puree to the base of your dish. 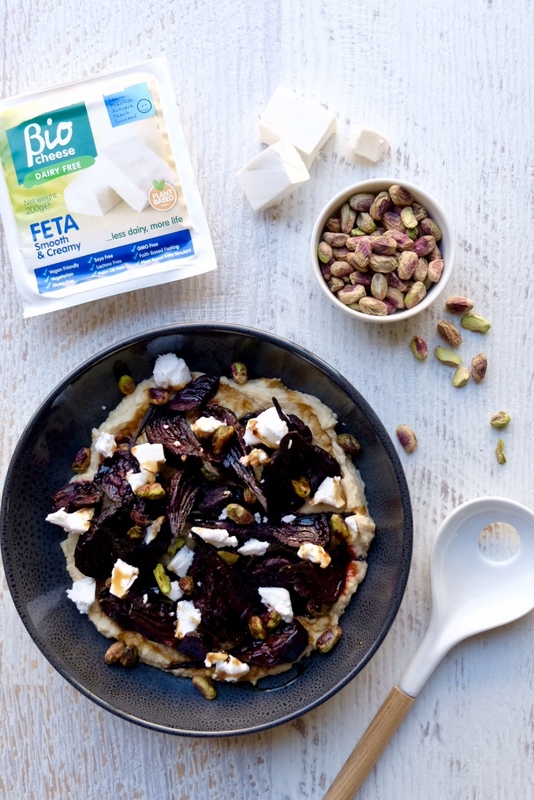 On top, place your beetroot pieces, toasted pistachios and a crumbling of Bio Cheese Feta. Drizzle with pomegranate molasses for a hint of sweetness.